Though she tours at a somewhat less brisk pace than she used to and has been raising two kids in recent years, 90s-famous singer-songwriter Ani DiFranco is back on the road again this year, and today we receive word that she'll be doing a show at Berkeley's UC Theatre Taube Family Music Hall on October 7, and another at the Fillmore in SF on October 8, 2016. Tickets for the Berkeley show and tickets for the Fillmore show both go on sale this Friday, April 1, at 10 a.m.
DiFranco's last studio album was 2014's Allergic to Water, which followed 2012's ¿Which Side Are You On?, and it marks a continuation of her highly personal, sometimes political brand of feminist alt-folk though with the recent influence of her new adoptive home, in the Bywater neighborhood of New Orleans. Her last appearances in San Francisco were a year ago this month, when she did a pair of shows with Pearl and the Beard at The Fillmore and The Warfield. The longtime independent spirit who spent her teens, twenties, and early thirties touring pretty constantly and putting out a new album every one to two years. She now has 24 albums to show for a career that's spanned over 26 years, all published by her own record label, and the once shaved-headed, proud bisexual writer of coffeehouse-style, staccato-poetic guitar ballads like "Fire Door" and "What If No One's Watching" is now a mother of a nine-year-old girl and an almost three-year-old boy, Petah and Dante. She's raising the kids with their dad, her partner and producer Mike Napolitano. Says DiFranco, in an updated website bio, "It’s such a humbling, and grueling, thing to raise children. And that makes playing music more precious and makes me more grateful. It’s a real balancing act, but it also has a balancing effect." 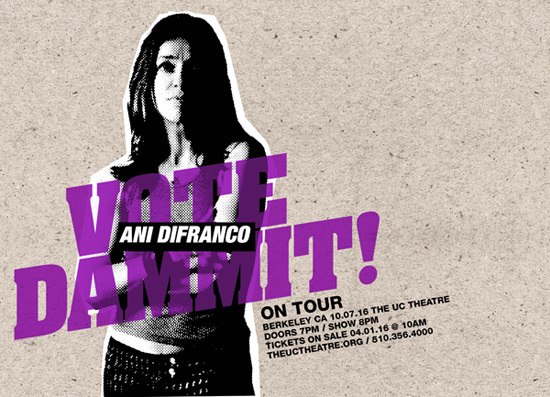 And, naturally, this being an election year, you can expect DiFranco to weigh in from the stage on whatever the state of politics ends up being come October  and as you can see from the concert art below, she's telling everyone to "Vote, Dammit!" For more on her recent life, you can check out this 2012 interview from Relix. Landing at SFO can be a pretty, if sometimes harrowing experience (short runway). A nice distraction: The salt marshes that form a quilt of various umbers around the southern part of SF Bay.